During the run-up to the November 12 release of my first book, Junkyard Planet: Travels in the Billion Dollar Trash Trade, every weekday I’m posting a new photo taken during my decade of reporting on the global waste, recycling, refurbishment, and repair trade. 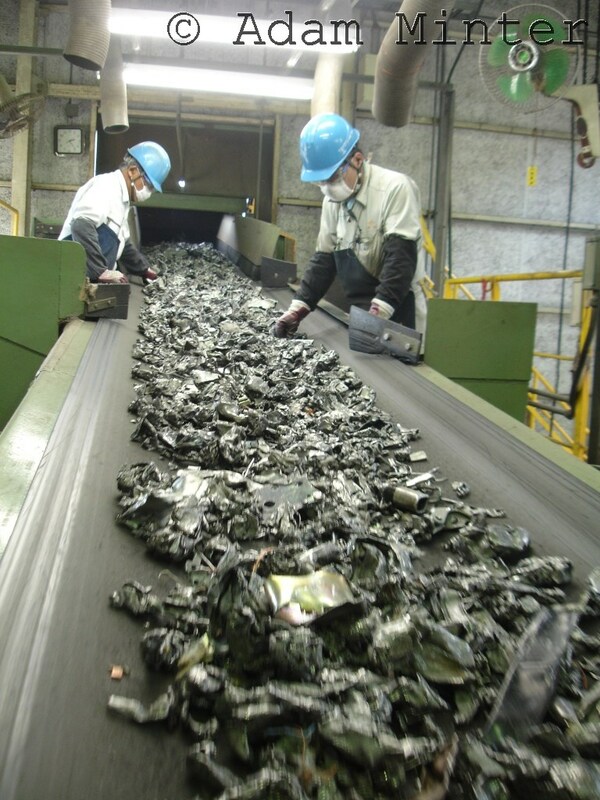 Today’s scene shows the remains of a Toyota test vehicle – possibly several – just run through a metal shredder (in fact, the one in yesterday’s Scene from a Junkyard Planet) at the Toyota Metal facility in Nagoya, Japan. As always, click to enlarge. How was an automobile transformed into this? Simply, the car was fed to a couple of dozen super-hardened 300 lb spinning hammers that pulverized it in seconds. Once reduced to chunks, the car was run past magnets and the steel was pulled out. Everything that’s not steel was sent elsewhere. The workers standing over the line are responsible for grabbing any stray pieces of copper, aluminum, plastic, or whatever else might have leaked into the steel. From here, the steel is delivered to a steel mill where it’s melted down into a form suitable for making new Toyotas. This is not a niche activity: in the US, at least, shredded cars account for around 1/3 of the raw materials that go into making steel. In some countries, including Japan, the ratio is even higher.